Swami Vishnudevananda was well known for flying a psychadelic Cessna into war torn and disupted border territories in an effort to unite people and demonstrate the absurdity of violence in the name of man-made borders. That beautiful plane, now housed at the Sivananda Ashram in Val Morin was painted by Peter Max, best known for painting the Beatles' Yellow Submarine album cover. Wow! I had no idea this recording existed until today! Well worth a listen... ummm well, except maybe the first four minutes or so.... but thanks to the wonders of technology you can just skip ahead! 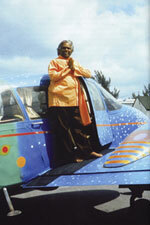 Today, November 9, is the anniversary of the Mahasamadhi of Swami Vishnudevananda. Swami Vishnudevananda has been an inspiration to millions of yogis and yoginis around the world, breaking man-made boundaries and encouraging "Unity in Diversity". He taught that a daily yoga practice including proper exercise, proper breathing, proper diet, proper relaxation and positive thinking is the way to inner peace and world peace. You can also read here about Swami Swaroopananda's first lesson from Swami Vishnudevananda. 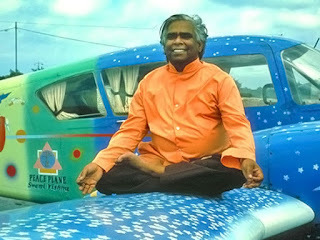 Om Bolo, Swami Vishnudevananda Maharaj Ki - Jai!! !